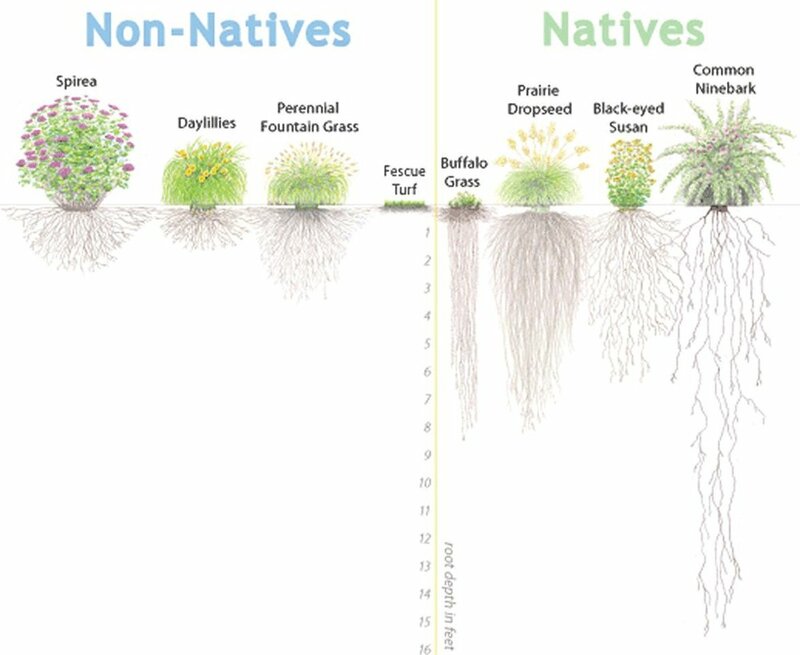 Plant native plants and control non-native invasive plants. The typical suburban lawn is nearly as impervious as a parking lot! Native meadow grasses infiltrate stormwater better and provide critical habitat for grassland birds. Avoid bare soil so it does not erode and run off into streams. Recycle your yard waste and use it as mulch, or be sure to dispose of it properly away from a waterway. Reduce household chemical use, and use proper disposal methods. Things like cleaning products, medicines, oil-based paint, and electronics may not simply be thrown in the trash or flushed down the toilet. Look for hazardous waste and electronics collection days near you. Read this FDA article provided by the Montgomery County Health Department: "How to Dispose of Unused Medicines"
Image Credit: SeeKamp Environmental Consulting Inc. 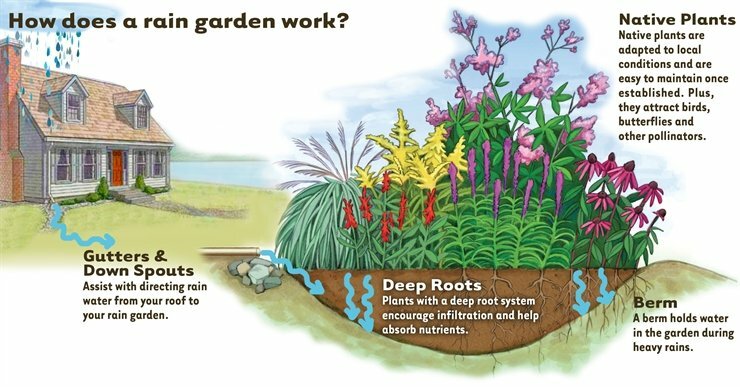 Convert a section of your yard to a rain garden. A wet area in your yard can be considered a nuisance or an amenity, depending on how you manage it. If it's wet, look for native plants that like “wet feet’ and create a visual focal point. Cut back on lawn fertilizers. Much of the fertilizer you apply in the spring flows directly into the local creeks because the grass is not ready to absorb it. Fertilize only in the fall, or use a mulching mower to create a healthy, organic lawn. Check your vehicle for leaks and have any fixed. Wash your car at a car wash and wash other things indoors at a sink. Bag pet waste and keep livestock out of streams. Animal wastes carry many harmful bacteria and possible diseases. They make creeks less amenable to native critters and require expensive water treatment for human use. Community members building rain barrels at our annual Rain Barrel Building Workshop. Make sure your septic system is working properly. Leaky septic systems are the cause of a lot of the coli-form bacteria in our creeks. High bacteria counts in waterways can spread disease and therefore prevent recreational activities. Disconnect your downspout from the street drain. Even clean water, in high volumes, can pollute streams by eroding stream banks and dragging silt into the water. Prevent this by letting your yard help filter out impurities and infiltrate stormwater back into your aquifer. Consider installing a rain barrel. Keep storm drains clean. Do not allow yard waste, litter, or anything but water to enter a storm drain or stream. Raise your mower height to at least 3 inches and never mow within 50 feet of a stream (riparian buffer zone). Plant trees and maintain streamside buffers. Streamside trees and native vegetation help filter stormwater run-off and help hold streambank soils in place. They can also filter out excess fertilizers and pesticides from adjacent farm fields. Furthermore, developing in the floodplain increases flooding substantially. Keep your paved surfaces at a minimum. Patios and parking spaces can be created with attractive pervious materials that allow stormwater infiltration to the soils below. Promote clustering where new development is likely. Clustered developments require less pavement for roads and sidewalks and keep more of the overall parcel as natural open space. Conserve water away from home. Check out these tips while on the road.